Hello, and welcome! 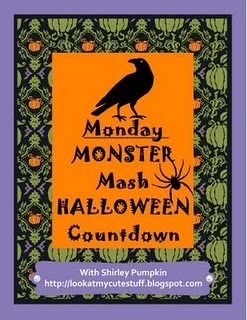 It's week 5 of Shirley's Halloween Countdown Monster Mash Blog Hop. I ran across this super easy, cute idea for a Hershey's Kiss Wrap while blog browsing. The idea came from my upline, Angie Kennedy. I changed it just a bit by using the pumpkin stamp from Got Treats. Although you can't see them, there are 5 little kisses nested inside. They are Hershey's new Air Delight Kisses. I saw the name, and knew I had to try them, but was a bit disappointed. They are good, mind you, but not as good as I thought they would be. All the same, it hasn't kept me from eating quite a few while working on this project. Thank you for visiting my blog! I hope you have a wonderful day. I want some! LOL JK! Love your treat holder. Oh too cute Jean! Love the googlie eyes on your sweet little pumpkin. Thanks for sharing! This is a great little treat to hand somebody! I like the texture on the container, as well as those adorable googly eyes. That is so cute, I just love the shape of it. Does the Air Delight mean they have less calories? lol Thanks for making a project for the Halloween Blog Hop! !